WHAT IS A DEAD LIFT? A deadlift simply involves picking something up from the ground to standing up straight with your arms hanging straight down. It is a dead lift because the weight starts in a static “dead” position on the ground, there is no lowering phase in which the muscles can stretch first and be assisted by elastic recoil. We usually acquire this basic human movement around the second year of life. The deadlift is defined by the start and end position of the weight not by the angles of your body. When the weight is light there is a wide variety of ways to deadlift, but when the weight is heavy there are only two safe ways to do it: the squat technique and the hip hinge technique. In the squat technique the shins and knees come forward. The quadriceps are worked more with this technique. In the hip hinge technique the shin stays nearly vertical. The gluteus maximus, hamstrings and adductor magnus are worked more with this technique. 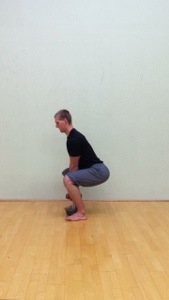 It is safer for the knees but requires more hip flexibility and works the low back more. The barbell deadlift is an exercise in the gym that allows us to take that basic human movement and gradually increase the weight so that we get stronger. The only advantage to the barbell over lifting other things like say rocks or your growing child is that the barbell is easier to grip and more convenient to add weight to. A kettle bell or dumbbell is a great place to begin the dead lift as it doesn’t involve the tricky coordination of getting the knees around the bar. If you want to continue getting stronger you will eventually have to move to the barbell in order to add more weight as most people don’t have 200lb kettlebells lying around. The deadlift is a phenomenal strength building exercise as it uses the largest muscles in the body in their strongest position. The world record for dead lifting is (1,015 lb) by Benedikt Magnusson. Although working primarily the gluteus maximus, the hamstrings, adductor magnus and the quadriceps, every muscle on the backside of the body is activated during the deadlift. Eventually grip strength and low back strength become the limiting factors. Regarding the low back, Colado in 2011 and Hamlyn in 2007 both found the heavy barbell squat and deadlift elicited twice as much activity from the erector spinae (low back muscles) compared to the superman, side plank and unweighted versions of squat and deadlift. No difference in obliques and transversus abdominus. For a more in depth description of barbell lifting for core activation see me previous post: Balls Vs Barbells. The low back is the area most at risk of injury in dead lifting with poor form. Here are the four most common errors that will put the back at risk. 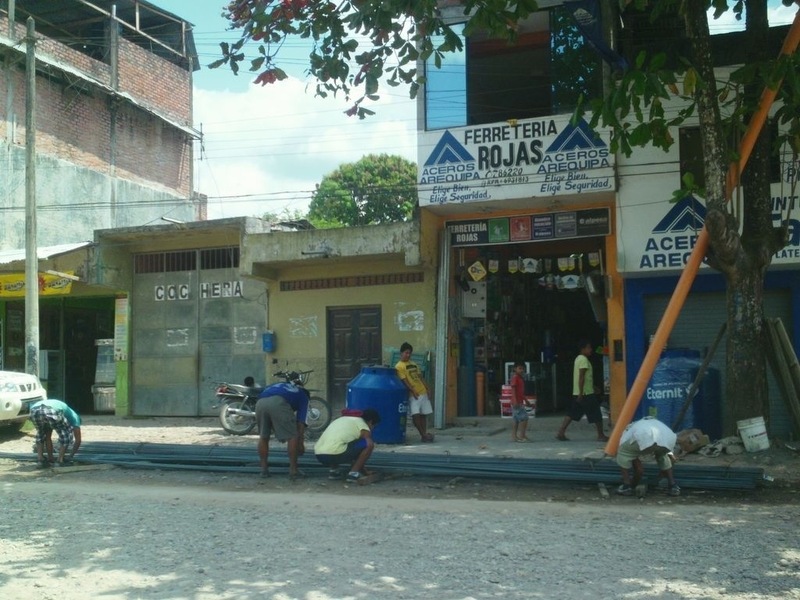 I took this picture of some construction workers in Tingo Maria Peru who were dead lifting rebar with rounded backs. Dead lifting with a rounded back increases the load placed on the intervertebral discs, thus increasing risk of a painful and potentially incapacitating disc herniation. 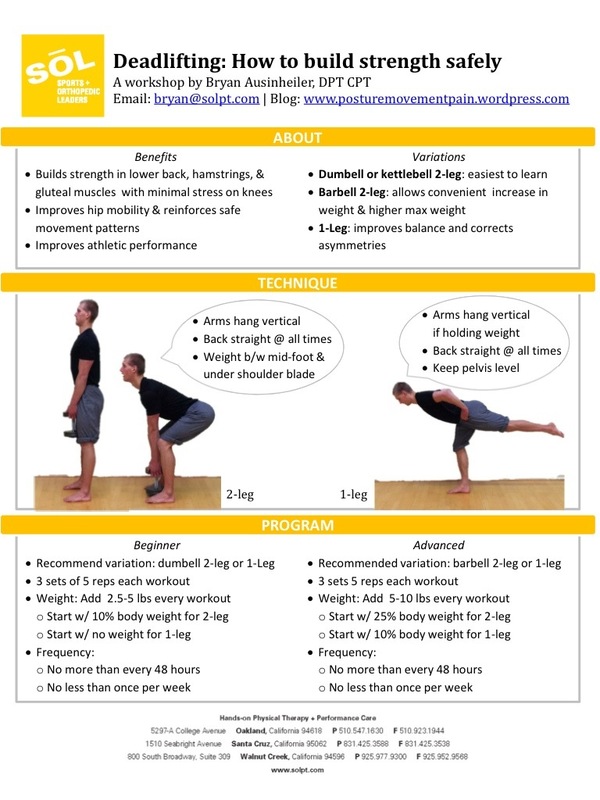 Here is the handout from my dead lifting workshop. You can take this with you to the gym as a reminder. Bryan: Why is the head “craned” UPWARDS in the second photo (depicting the bottom of “Deadlifting”: 2-leg technique”)… I’m always confused by this. Considering alignment & posture, why aren’t we exercisers taught to keep our head (cervical spine) neutral & more-or-less in line with the rest of the spine? Please help me understand why it would be incorrect to exercise with my head (chin tucked down & in, re this example) in a more “neutral” postural alignment. Thanks for your response. I appreciate you thinking critically about this article. The head position comes from a research article I read a long time ago that found that people could squat more weight when they were cued to look up. (unfortunately I wasn’t able to find this article) Cervical extension positioning is nearly universal in world record deadlift attempts. This is probably because looking up activates the full body extension synergy pattern and the extensor muscles (paraspinals, gluts, hamstrings, quadriceps, triceps surae) are responsible for lifting the weight. The position of my cervical spine in the picture is probably more than most people need to get the benefit of looking up and it is certainly more than I would recommend for someone with an issue aggravated by cervical extension such as a disc injury or spondylosis.